The next deadline for Bicycle Friendly Community (BFC) applications is coming up on February 13. Carrollton, GA is a community that stood out with the quality of their BFC application, which can be seen in this Carrollton BFC application website. To apply for BFC status, follow this link. Carrollton’s BFC application was an unexpected pleasure. I look forward to more communities like Carrollton who bring energy and unique stories about how bicycling developed in their community. Carrollton, Georgia is the commercial center of Carroll County, which sits on the Georgia-Alabama border. Nicknamed “The Friendly City” and home to the University of West Georgia, West Georgia Tech and the Southwire Company, this city of roughly 26,000 and growing embarked on a bold vision for improving bicycling over a decade ago. Through persistence, cultivation and collaboration the seed of the Carrollton Greenbelt grew into a physical and cultural asset that is changing what bicycling looks like in their community. The Carrollton Greenbelt is in some ways a microcosm of the evolution of bicycling in the United States. In the 1990s, the Greenbelt existed as a mountain bike trail, singletrack and rugged. To be a bicyclist was a conscious choice and not for everyone. 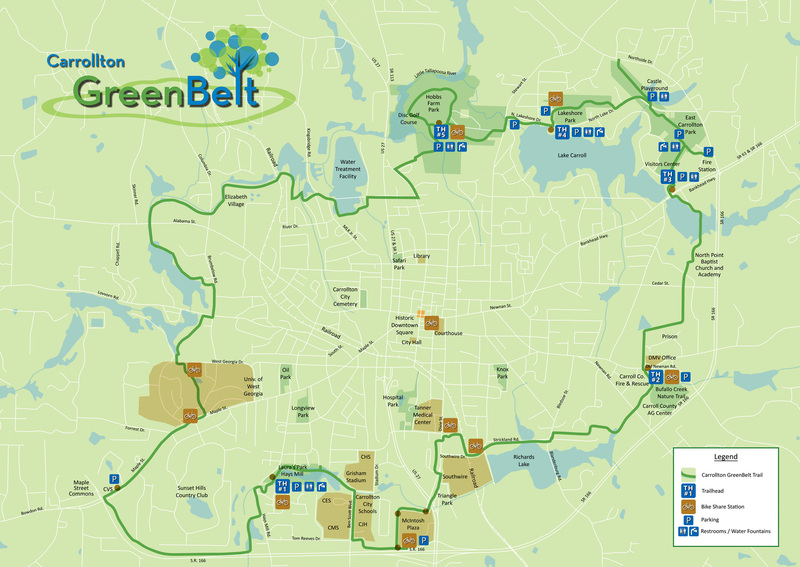 In the initial phases of the Greenbelt, it mirrored two strategies for incorporating bicycling in communities that have been pursued nationally — creating Safe Routes to School programs and providing recreational trails. The first mile of the Greenbelt was a proof of concept, improving the mountain bike trail of the 1990s to create a safe, paved, path next to a school and became a recreational destination. As the trail grew, thanks to a public-private partnership including significant local foundation funding, it began to connect businesses — including the community’s three largest employers — and became not just a destination, but part of the transportation infrastructure. As a completed trail, 18 miles in length, the Carrollton Greenbelt is more than something defined by cyclists, but is defined by all who use it and by the many ways they use it. To talk about the Carrollton Greenbelt as a trail — a familiar loop encompassing the city, an echo of Atlanta’s beltline, or an oasis of safe bicycling in a city, county, or multi-state region where such infrastructure is often lacking — is both worthwhile and missing the point. Without the trail, and its promises of separated, safe and stress-free bicycling, there would not be the same culture that permeates the conversation about bicycling in Carrollton. In building the Greenbelt, the city of Carrollton has also built its bicycling culture. One of the great struggles of the Bicycle Friendly Community (BFC) program is to account for “soft” factors that make bicycling in a certain place great. It is fairly easy to look at a map, to look at data on bicycle commuting, bicycle safety or bicycle events and form some metric-backed opinion on whether a community deserves an award and what level it should be. If you have some time, I wholeheartedly recommend looking at the well-organized Bicycle Friendly Community site created by Martyna Griffin and the Friends of the Carrollton Greenbelt. It does a great job of illustrating developments in the community through pictures and words, using the BFC process as a guideline for a broader exploration of biking in Carrollton. There is no way for me to describe the entirety of the effort that is enthusiastically explored in the 72-page guide to the Carrollton Greenbelt. The level of detail provided by Carrollton begs the absurdity of ascribing precious metal grades to communities and hints at the value of this external motivation. 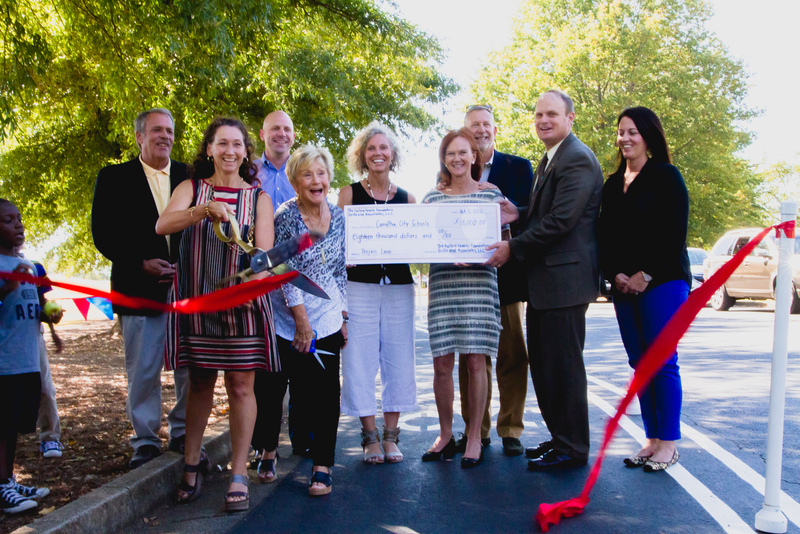 It conveys the celebration of Carrollton’s astounding community accomplishment — building an 18-mile loop trail in five years thanks to over $1 million in private grant funding and broad community collaboration that has driven changes in the local culture for recreation and bicycling. Carrollton’s BFC application was an unexpected pleasure. One of the great parts of the BFC program is providing an opportunity for each participating community to reflect on its actions and compare themselves to others. As the program continues to involve, most recently to include an online-discussion forum for further facilitating best practices, I look forward to more communities like Carrollton who bring energy and unique stories about how bicycling developed in their community. Ken McLeod is the League’s Policy Director.